Philosophers predicted it, historians talked about its implications and the common man feared its coming, but unfortunately no one was able to stop it. The third world war is here, albeit of a different kind. Ever since their invention, tablets have been taking the world by storm; they are powerful, portable, easy to use and loads of fun. TechCircle.in brings to you an exclusive three part feature based on the various tablets that are currently available in the market, are soon to be launched or have just been announced by various companies. We have divided the warriors (tablets) into 5 basic categories that are the big players, the game changers, the Indian babies, the underdogs and the foreigners. The first war was decided by military might, the second with nuclear power, but the third one will be decided on the basis of in-built memory, processor power and configuration. Let the war begin. These are the big daddies of the tablet market; most like them, some hate them but everyone wants a piece of them. The ones which have been launched are already hot property in the Indian market while the ones yet to be launched are eagerly awaited by consumers. What better way to start than with the iPad2. The latest offering by Apple has hit all the right cords, in addition to being faster, iPad 2 features a new design that is 33 per cent thinner and up to 15 per cent lighter than the original iPad. It has the same 9.7-inch LED-backlit LCD screen as its predecessor and features Apple's 1GHz dual-core A5 processor, a front-facing VGA camera and a rear-facing camera that captures 720p high definition video. Apple also claims up to 10 hours of battery life with the iPad 2. Add to this mixture the all new operating system from Apple, the iOS5 with more than 200 new features and iCloud, Apple's cloud services offering and you have a concoction that can compel even the stingiest people to empty their pockets. Steve Jobs, Apple's CEO said "While others have been scrambling to copy the first generation iPad, we're launching iPad 2, which moves the bar far ahead of the competition and will likely cause them to go back to the drawing boards yet again." Height: 241.2mm, width: 185.7mm, depth: 8.8mm and weight 601 grams, while the Wi-Fi+3G model weighs a little more at 613 grams. The iPad 2 is available in Wi-Fi only or Wi-Fi+3G. The Wi-Fi version is priced at Rs.29,500, Rs.34,500 and Rs.39,500 for the 16GB, 32GB and the 64GB models while the Wi-Fi+3G version is priced at Rs.36,900, Rs.41,900 and Rs.46,900 for the same models, although if you can, it's better to buy it from the US where it is a few thousand cheaper than its price in India. It is the most sought after tablet (at least in the grey market) in India due to its double as a mobile phone for calls in addition to being a regular tablet. Samsung's Galaxy Tab has a 7 inch TFT capacitive touchscreen, runs on Android 2.2 Froyo OS and has an ARM Cortex A8 1GHz processor. It is considerably lighter and smaller than the iPad 2 and Samsung promises a 7 hour battery life. Until recently, Galaxy Tab was the only tablet by Samsung but now there are two new versions â€“ Samsung Galaxy Tab 8.9 and 10.1v (P7100). The new tablets will have the Android Honeycomb OS and Dual-core 1GHz ARM Cortex-A9 processors and ULP GeForce GPU, Tegra 2 chipset and 1GB of RAM. As the name suggests they will have an 8.9 inch and a 10.1 inch capacitive touchscreen display respectively, 16/32/64GB storage and a 3.15 megapixel auto-focus camera with 720p video recording and LED flash plus a 2 megapixel front facing camera. "The Samsung GALAXY Tab has made rich communication truly mobile. There is a new and emerging consumer demand that the Galaxy tab seeks to satisfy and we feel that this demand is poised to grow phenomenally as users begin to experience the limitless potential of this device," said Ranjit Yadav , Director-Mobile & IT. These tablets are yet to hit the Indian market but according to Blackfridaydeals.in, the 16GB and 32GB versions of the 10.1 inch device will have a price tag of Rs.22,379 and Rs.26,864 while the 16GB and 32GB versions of the 8.9 inch device will be available for Rs.21,064 and Rs.25,519 respectively. HTC will launch its first instalment of tablets in India by the end of this month. 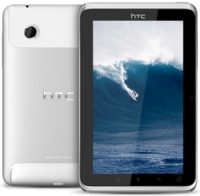 Their tablet is called HTC Flyer; let's hope it manages to fly its way into consumers' homes too. It is a 7 inch TFT capacitive touch screen tablet with aluminium uni-body construction and will come with Android 2.4 OS (no Honeycomb). The tablet is powered by a 1.5GHz Qualcomm Snapdragon processor, has 1GB of RAM and an expandable memory of 16GB. The tablet will also have the new HTC sense user interface and a 5 mega pixel camera which captures high definition video and a front facing 1.3 mega pixel camera. HTC claims the battery will deliver up to 4 hours of continuous video playback. HTC has also partnered with OnLive, and will launch the first cloud-based mobile gaming service on a tablet. "Clearly, smartphones have transformed our lives but as we observed how people use smartphones, computers and other technologies, we saw an opportunity to create a tablet experience that is different, more personal and productive," said Peter Chou, CEO of HTC Corporation. The tablet is already available for online purchase at Letsbuy.com for a price of Rs.37,499 and a delivery time of around a week. The tablet is promising but HTC has made a poor choice in terms of pricing if it actually wants to compete with the likes of iPad and Galaxy Tab. 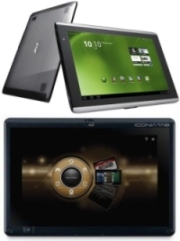 Acer India had also introduced two new tablets in the market- Acer ICONIA TAB A500 and the Acer ICONIA TAB W500. Although it's been months since Acer's announcement, the tablets are yet to be officially made available to consumers. The Acer ICONIA TAB A500 runs on the Android 3.0 Honeycomb OS and has a 10.1 inch high resolution capacitive multi-touch display. It has a dual-core NVIDIA Tegra 2 CPU inside and has HD-optimized graphics from the ultra-low power NVIDIA GeForce GPU. Acer has added new applications like SocialJogger, MyJournal and ScrapBook tp the tablets. Acer ICONIA Tab W500 has Windows 7 Operating System. It is a hybrid design and has a 10.1 inch WXGA screen. It has a dual-core AMD processor with integrated graphics and Dolby Advanced Audio v2 audio enhancement for better sound. Acer has also introduced the Acer Ring that puts a selection of applications and utilities chosen by the user at their fingertips. Both the tablets have SIM Card support and optional 3G. The Acer ICONIA TAB A500 will cost Rs.27,900 in the market and the Windows 7 tablet Acer ICONIA W500 will be priced at Rs.32, 499. After the long wait, the BlackBerry Playbook will finally be available in the Indian market from next week. Earlier this year, more than 1000 Playbook tablets were returned due to a bug; let's hope that is not the case in India. The BlackBerry Playbook has a 7 inch TFT capacitive touchscreen with 16 million colours and runs on BlackBerry Tablet operating system. It has a 1GHz dual-core Cortex-A9 CPU, Power SGX540 GPU and a TI OMAP 4430 chipset. It has 1GB of RAM and is available in 16/32/64GB of storage. The tablet has a 5 mega pixel camera which captures 1080p high definition videos and a 3 megapixel front facing camera. BlackBerry Bridge lets you view the email, BBM, calendar and address book on your BlackBerry smartphone on the larger BlackBerry PlayBook display. "Initial feedback about the BlackBerry PlayBook has been outstanding," said Mike Lazaridis, President and Co-CEO at Research In Motion. "Our strategic decision to invest in ground breaking performance, web fidelity and an open web-based development environment is resonating extremely well with customers and developers." The tablet is expected to be priced at Rs.30,000. This concludes the first part of the war of the tablets; all the above mentioned tablets have the muscle power and the name to rule the tablet market but there can always be a surprise entry which can give them a run for their money. Stay tuned for part two where we talk about the game changers and the underdogs and understand their strategy for winning for winning the war.